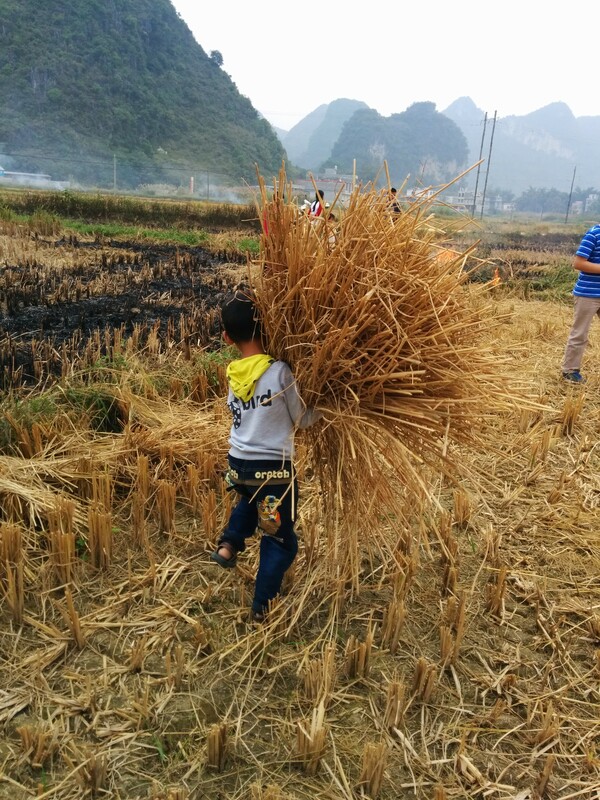 Now that the rice has been harvested, everyone is burning their fields, which makes for really cool-looking scenery. 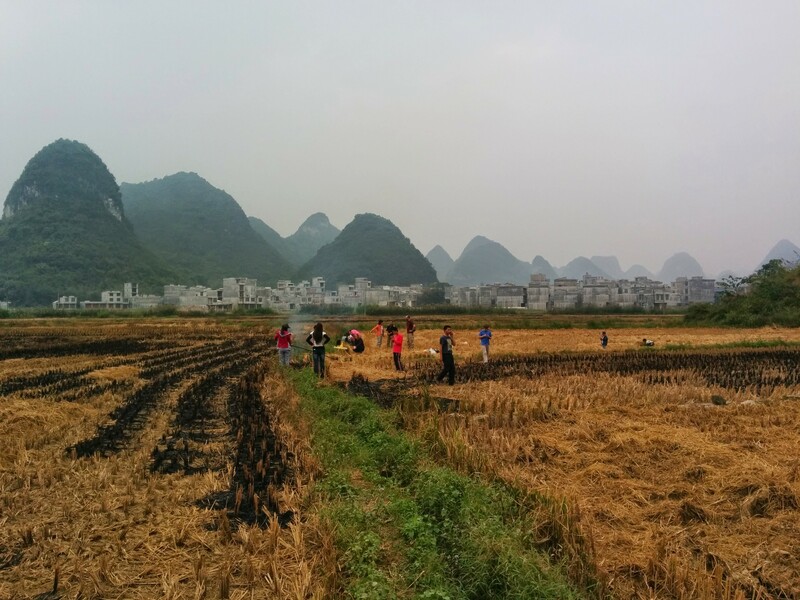 Apparently, after rice is harvested is also when family and friends gather in the fields to make a bonfire from the rice straw, and use the fire to roast bamboo tube rice. I didn’t even know it was “A Thing,” but it is. And guess what. We got invited! I was very excited. 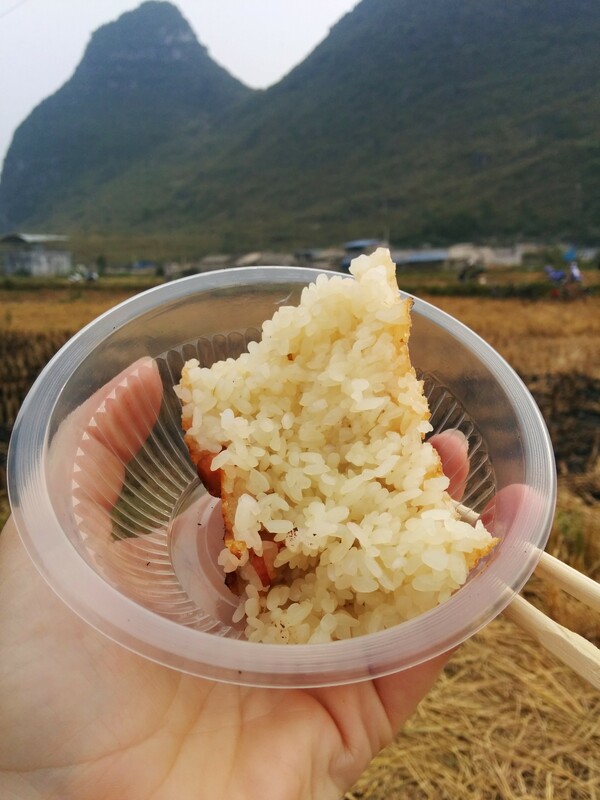 Rice and bits of sausage are mixed together and stuffed into sections of bamboo. 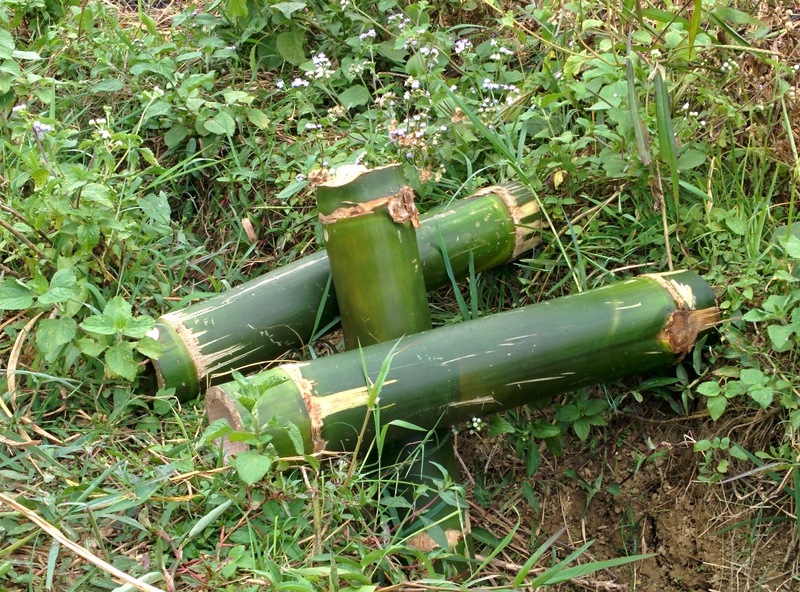 These got put in a little (dry) irrigation ditch that runs between the (also dry) rice paddies. Here are the tubes, pre-bonfire. And here’s what the rice paddy looks like after the rice has been harvested. 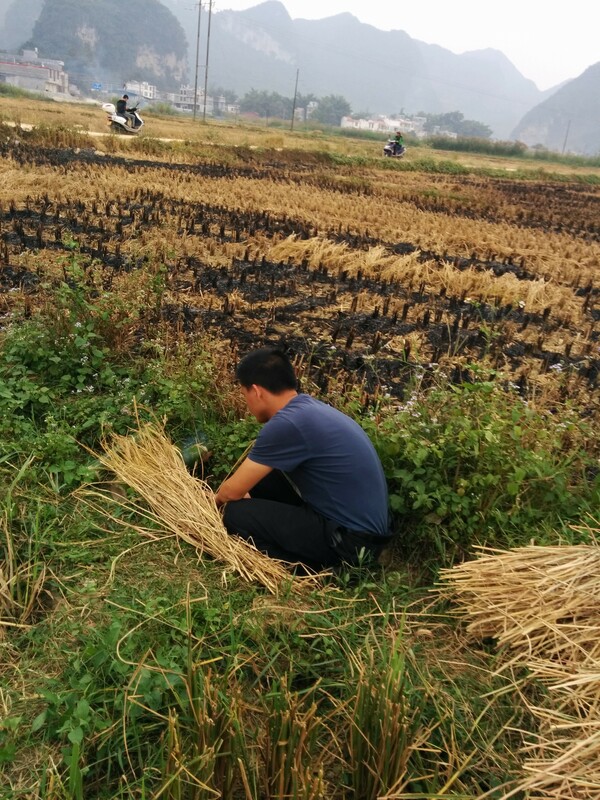 The straw is in long rows, and it’s our job to carry it to the bonfire. Everyone got a turn being in charge of poking the fire. I was one of the first ones, and I was informed that, “it’s okay that you’re not doing it right because you’re new at this.” Cool. That fire gets HOT, and puts out a great deal of black ash. We were wiping it off our faces and clothes, and out of our hair even after we got home. The kids thought carrying the straw was fantastic. This lihai kid kept carrying bundles bigger than himself. Still more straw. Keep going, kids. Awesome mountain, though, huh? The novelty of carrying straw eventually wore off. The kids decided to chase grasshoppers instead, since they were everywhere. Poor things didn’t know their lovely rice homes would be cut down this week. The kids used plastic drink cups for cages. 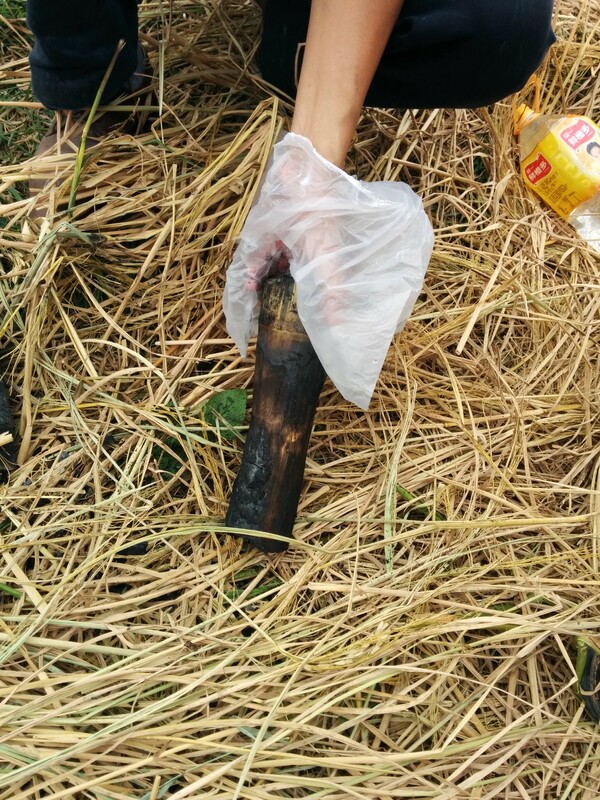 After an hour or so, the bamboo tubes were completely charred, and were declared ready. 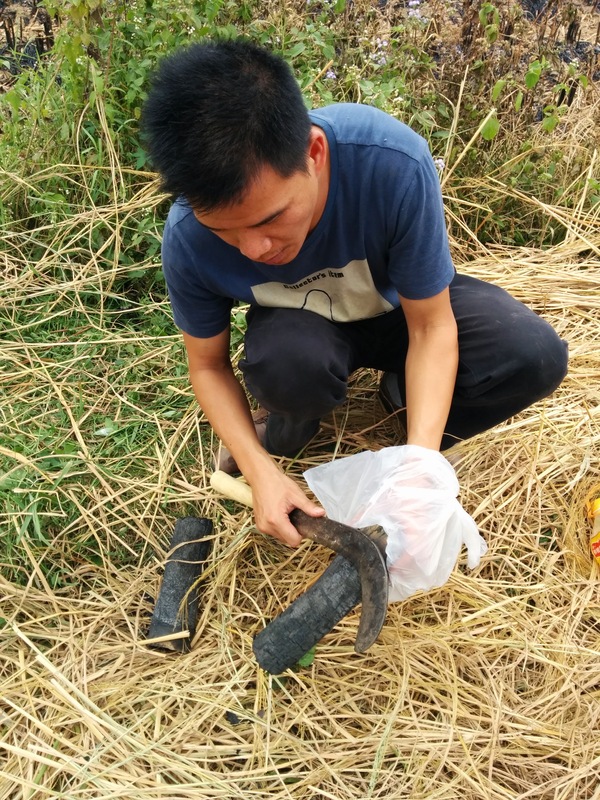 Our friend used a scythe to peel off the burnt outer layer, and then crack open the tubes. Here’s my artsy shot of the finished rice. You can kind of see the reddish-brown area on the left edge. 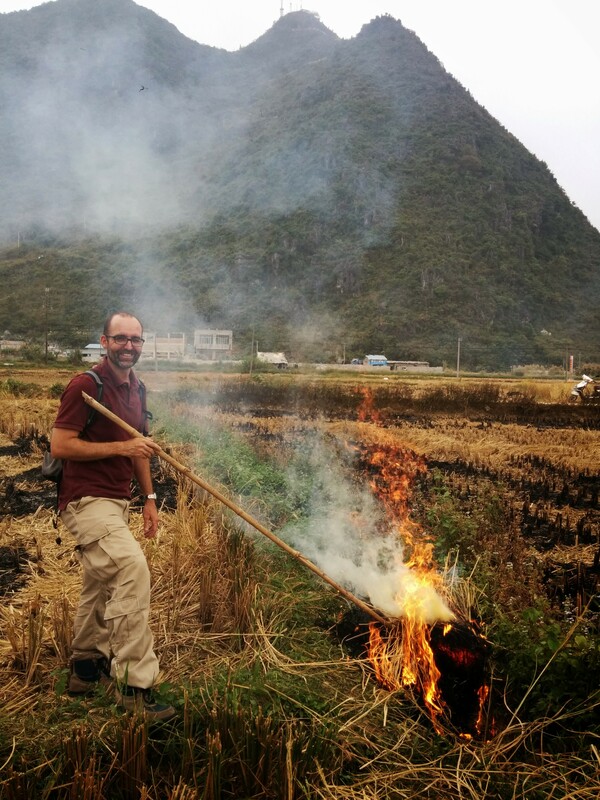 I should have flipped it over for another shot – the whole area that was touching the bamboo was practically burned, and the rice had basically cooked into one crispy layer. I am a huge fan of crispy, and I actually like it when my food is a little bit burnt (mmm, so carcinogenic! ), so this was probably the best rice I’ve ever had. This was such a wonderful way to spend a fall afternoon. The weather was lovely, the scenery was lovely, hanging out with friends was lovely. 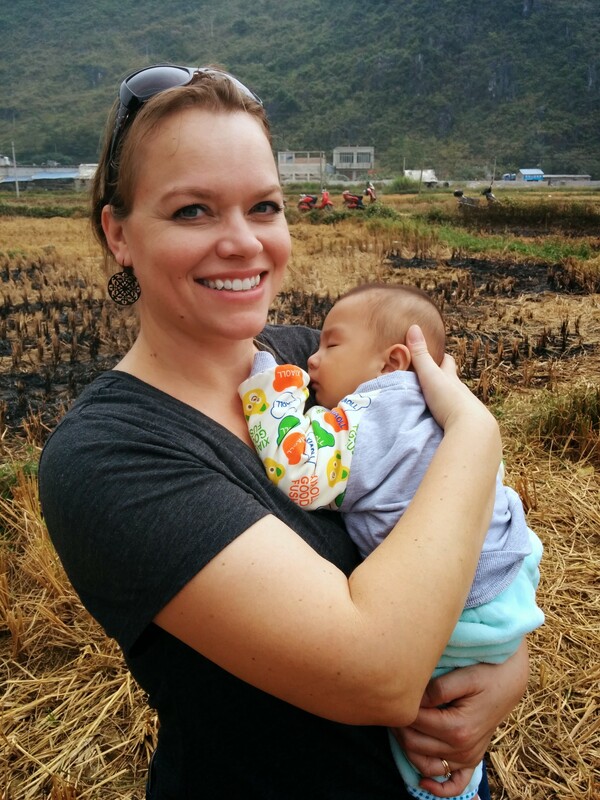 And if that wasn’t enough, I got to hold a little baby AND he fell asleep in my arms. His mom made me give him back, though. Stink. Thank you, Laurel. You are a great encourager. Burning fields are pretty for photos, not so pretty for our lungs, right? Thank you! I’m glad to have you along on the adventures!